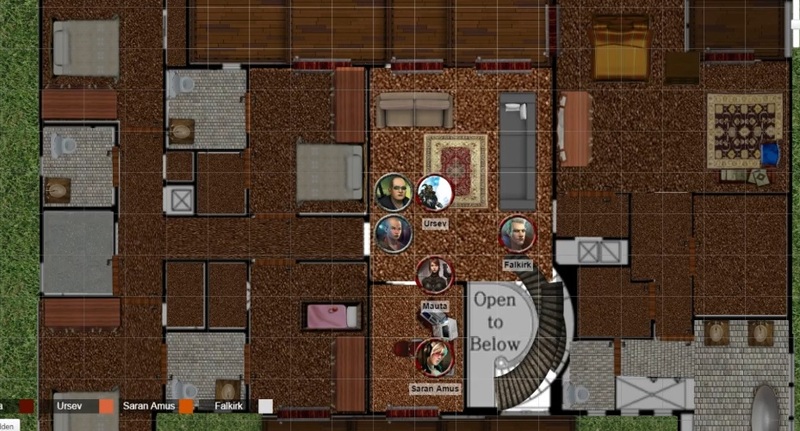 The stealthy infiltration devolves into a bloody shootout and knife fight in the foyer of the mansion as the runners wrap up the adventure. 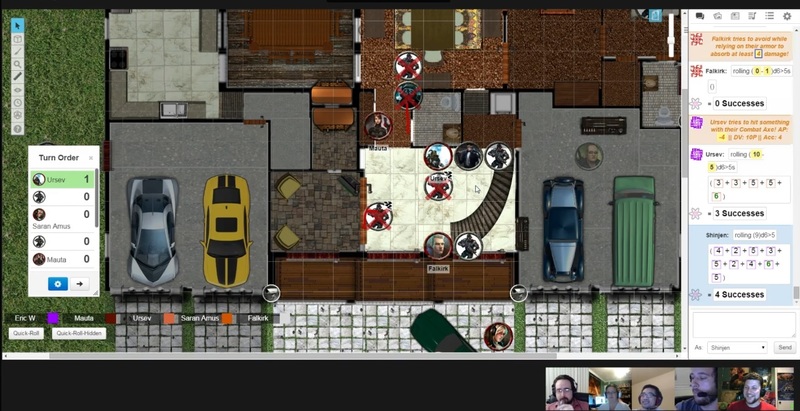 After two shortened sessions in a row, we were prepared to dive into a normal length session and really make some progress stealthily infiltrating the Yamoto villa. I’m pleased to say that, despite the mission devolving into one big combat sequence, we were able to complete the mission. It did take a very lengthy and extended session, thanks to my wife (who plays Mauta) being on vacation and off work this week. Three and a half hours later and my players have secured the evidence, making all new friends, and all new enemies. The session began right in the middle of the action. The party had split up: Saren had infiltrated the guard house outside the community gate and downloaded the floor plans. Mauta, pretending to be captured singer Lana Grace, had been taken inside the house to an upstairs bedroom. Falkirk and Ursev parked the van inside the garage and began snooping around the first floor. They quickly realized the house was crawling with guards, though none of them were actively patrolling at the time. I inserted a few scripted events to get the ball rolling and create a heightened sense of urgency. Lana’s mother would attempt to talk with her, and Lana’s father would return home also expecting to see his forcibly returned daughter. The players had such an impressive plan to get in, but clearly no plan once they were actually inside. They explored a bit – I was pleased that one of them found a hidden passage in the wine cabinet I had included. But they never came close to discovering the office or the computer with the evidence. Mauta was in trouble upstairs, and she opted to shimmy down the balcony and escape, narrowly avoiding the attention of a patrolling bio-engineered guard dog. At that time Saren used an Edge point to roll under an approaching car and let it drag her to the entrance of the house. Once the parents were upstairs banging on the door, the players decided to unleash a sneak attack on the guard in the foyer. It did not go well, with both missing and/or failing to take the guard out in one blow. Likewise Saren tried to sneak out from the car but was spotted by a nearby guard. Roll for initiative! Once the guards took their first move the jig was up as they radioed for intruders. The foyer quickly turned into a bloodbath as bullets flew, knives parried, and some serious damage was done to both runners and guards. The guards were fairly strong for random NPCs, rolling 10 total dice for their attack and 8 for defense, and the party ended up having to fight about half a dozen of them, though their staggered appearance helped immensely. I also had a ‘boss monster,’ a heavily augmented cyberwarrior named Shinjen. He nearly killed Ursev in one blow, but the troll shaman responded in kind with a heavy attack by his battle axe. Ursev was able to deflect the following killing blow, then use an Edge point to finish him off. Everyone sustained heavy amounts of damage but miraculously came away from the fight unscathed. I was honestly surprised as I thought a frontal assault would be suicidal. It did help that they were only ever fighting 3 or 4 at a time. Oh and Saren had to deal with a Cujo situation as he jumped in the car outside to avoid being eaten by the guard dog. That extended fight felt suitably climactic, so when the players went upstairs to confront the parents, they quickly acquiesced. To their credit my players did a fine bit of role-playing their exhaustion and bloodied-ness, and I let them talk to the parents without any social skill tests. They downloaded the Yamoto’s Yakuza involvement evidence and bugged the hell out of there. For the end it was a question of whom to turn the evidence into. 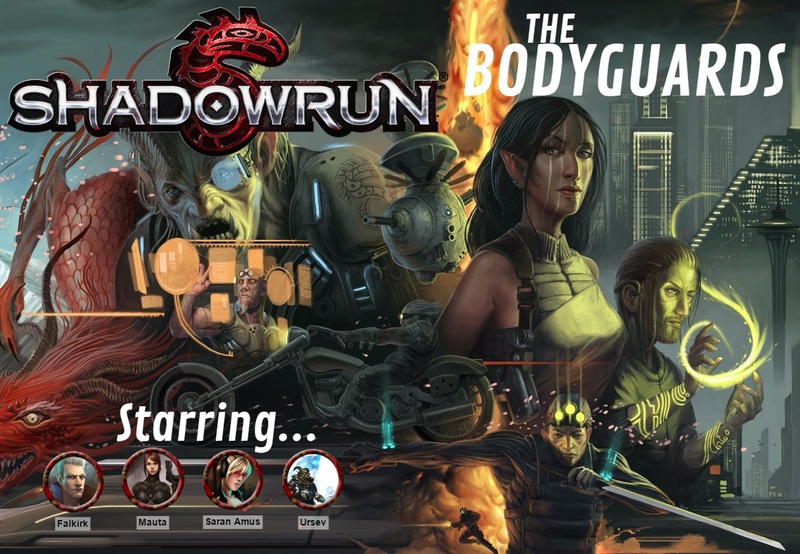 One of the recurring game concepts in the pre-made Shadowrun adventures I’ve read is to give the players multiple interested parties and let them decide whom to ultimately turn their McGuffin to. I liked this concept so I quickly inserted an authoritative figure that had staked out the Yamotos. Identifying herself as Ms. Johnson, she offered the players cash reward to hand over any evidence to her so she can take them down and strike a real bow to the Yakuza in the Seattle area. Of course the players were already working for Lana Grace, stealing the evidence to give her blackmail leverage she can use to keep her parents from every reaching out to her again. I enjoyed the little dilemma that occurred at the end as the players deliberated. Keep in mind this was after over three hours, yet everyone was enjoyable debating the ethics and ramification of their choice. Ultimately they decided to stick with Lana. They copied the data and told Ms. Johnson to give them 24 hours – an interesting monkey wrench that I could use for the next mission. Returning to a grateful Lana gave them about the same amount of money, which surprisingly they didn’t try to negotiate higher for. Maybe they took my not-so-subtle hint that acting selfishly/money-grubbing would naturally come with less of a karma payout (Shadowrun’s system of experience/skill points).